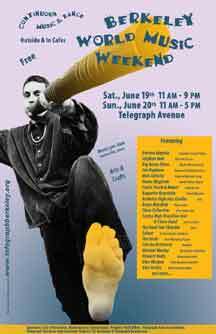 BERKELEY—The free Berkeley World Music Weekend will offer continuous music and dance performances throughout the Telegraph Avenue District between Bancroft Way and Parker Street on Saturday, June 19th, 11 am – 9 pm, and Sunday, June 20th, 11 am – 5 pm. Visitors will enjoy an impressive range of music played outdoors and insideTelegraph’s many cafés. Internationally acclaimed artists headline dozens of performers who bring a variety of traditions into contemporary music, such as Borrina Mapaka, Congolese singer and dancer; Stephen Kent, didjeridu; and Tim Rayborn, multi-instrumentalist. Mahal led by Evelie Posch is as versatile with Filipino traditional gong as ethnofusion. Other popular performers include the thrilling Algerian Amazigh singer, Moh Alileche with Danse Maghreb; Zulu Spear’s Khumbula; the rhythmic Afro-Cuban beat of Clave Collective; 1920’s café music by the Baguette Quartette (Parisian); Berkeley High Jazz Combo; and Crying High Jazz Brazilian & Choro Band (Rio de Janeiro samba). There will also be soloists such as the spectacular Big Bones Blues; Celtic fiddler Laurie Chastain, Hungarian cymbolam player Michael Masley; Renaissance lutist Howard Kadis; and accordion impresario Alex Yaskin. Whether it’s Klezmer (Simcha Orchestra), rocking blues (The Real Tom Thunder), Bluegrass & Cajun (The Shots), Sufi trance (Salaat) or Celtic melodies (Glenn Morgan), there is music for everyone. Not to be missed is the West Coast debut linking music with slam poetry for “World Lyric Slam,” hosted by the effervescent emcee Charles Ellik. What better time to discover Berkeley’s Telegraph Avenue and street artists than now, in a solstice carnival that showcases world music! For transit information and list of performance schedules, visit . The Berkeley World Music Weekend is sponsored by the City of Berkeley, the Alameda County Art Commission, the People's Park Office, the Telegraph Area Association, the Telegraph Business Improvement District, UC Parking & Transportation, and Telegraph Area businesses. This unique Berkeley event is held outdoors and inside the many cafés throughout the Telegraph Avenue area. Each year the Berkeley World Music Weekend celebrates two days of continuous music and dance performances and brings together an impressive array of world music traditions and many internationally acclaimed artists. Evelie Posch performs with and directs Mahal, "a kosmik-ethnik-ekstatik-trance -tribal fusion muzik ensemble" in this traditional Filipino song from the highlands. Each year the Berkeley World Music Weekend brings together an impressive range of world music traditions and many internationally acclaimed artists like Congolese singer and dancer, Borrina Mapaka.